Home › Uncategorized › Sirtex sinks. This is a progress chart review on Sirtex commenting on technical features. It makes no investment recommendation. Readers seeking such advice should consult their own financial advisers. There has been a strong rebound of the share-price from $15 to the 50% Fibonacci retracement level at about $27. 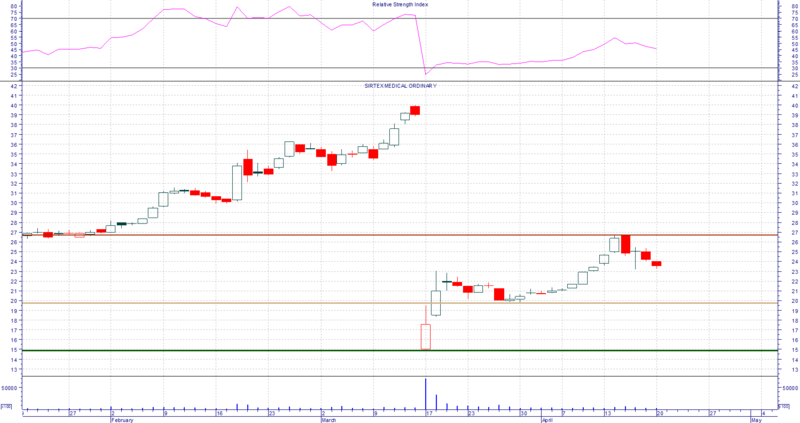 This impulsive move higher ended with a bearish engulfing pattern, followed by a Doji candlestick. The last two days of trading have continued the corrective move lower. The next support levels are at $20 and $15. From a technical viewpoint, those wishing to adopt a long position in Sirtex should look first for loss of momentum, and then respect of a support level, followed by a positive rebound in the share-price before investing. Let others pave the way before following them. The next observation to make is the level of the next low. A low higher than $20 would suggest that the share-price was transitioning to an uptrend. A failure for support at $20 to hold forming a low less than $20 on the other hand would suggest an evolving down trend, with still lower prices. The levels of short-term trend transition provide clues to market sentiment. At $27 buyers started to become fearful of overpaying for the shares, whilst holders of the shares were becoming more mindful of the need to lock in their profit.